Ah yes, horse, the other red meat. You know, I’ve never understood why horse meat was off-limits in America. I mean, it’s an animal not all that dissimilar to deer or elk and we certainly have no problems eating them. Is it because we ride horses? Would you eat a cow if you rode it? I don’t know. 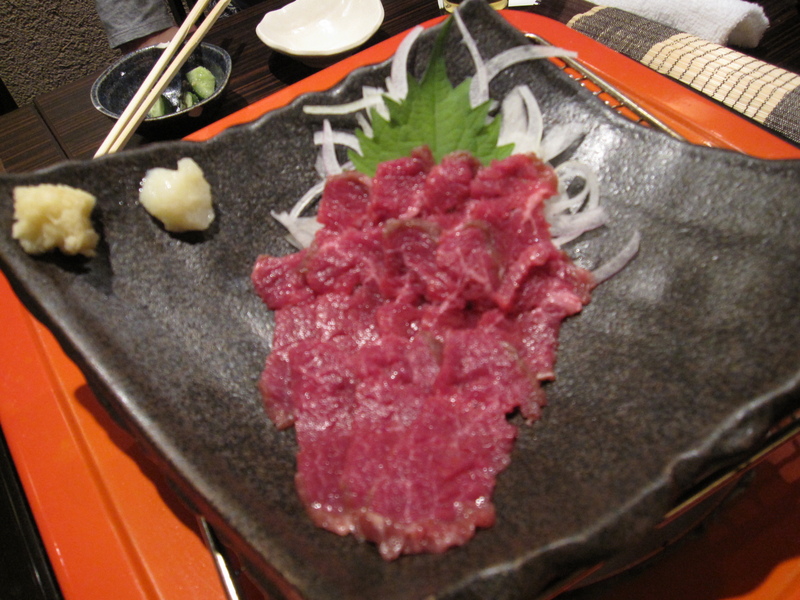 I do know that many other places in the world do eat horse, and Japan is one of them. 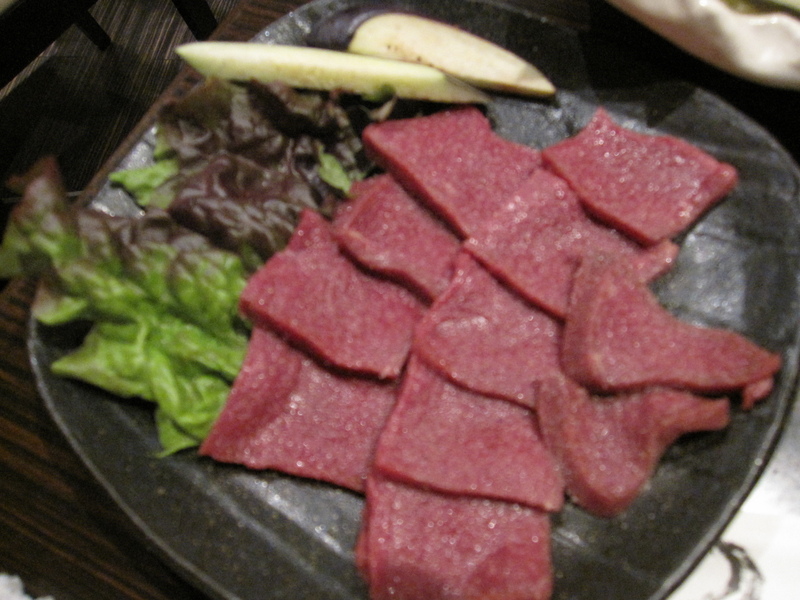 While it’s not a prominent animal in the extremely large, diverse, and interesting encyclopedia of animals consumed by the Japanese, it is featured in various areas where other meats might not be as readily available. As such, in places like Tokyo, there are restaurants dedicated to serving this animal on a platter rather than saddling it up for a gallop. The other night I finally got my first opportunity to enjoy the succulence of these animals when a friend of mine asked me if he could take me out for a horse. Not only is that the first time another man had ever asked me that questions, but that was a proposition I was only too happy to jump on. 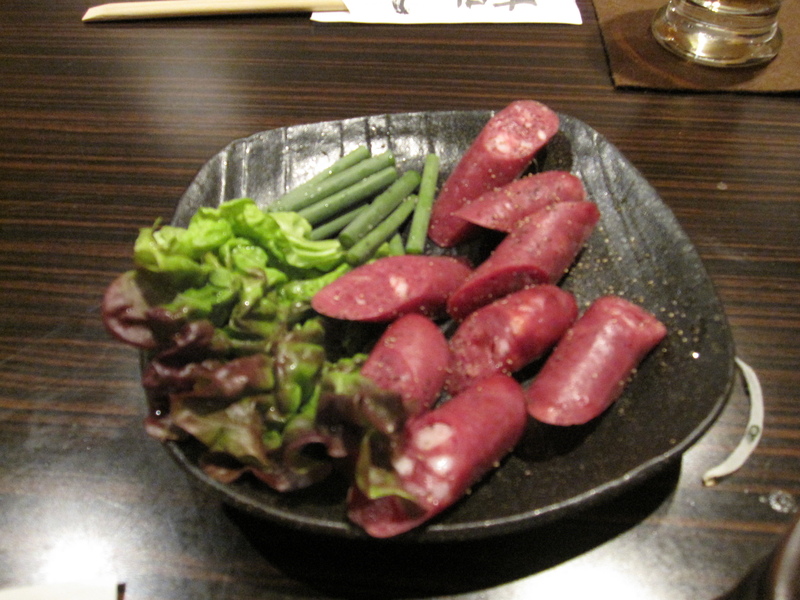 So, we headed out to the Ebisu district of Tokyo and headed to a place called Uma Yakiniku Takeshi. 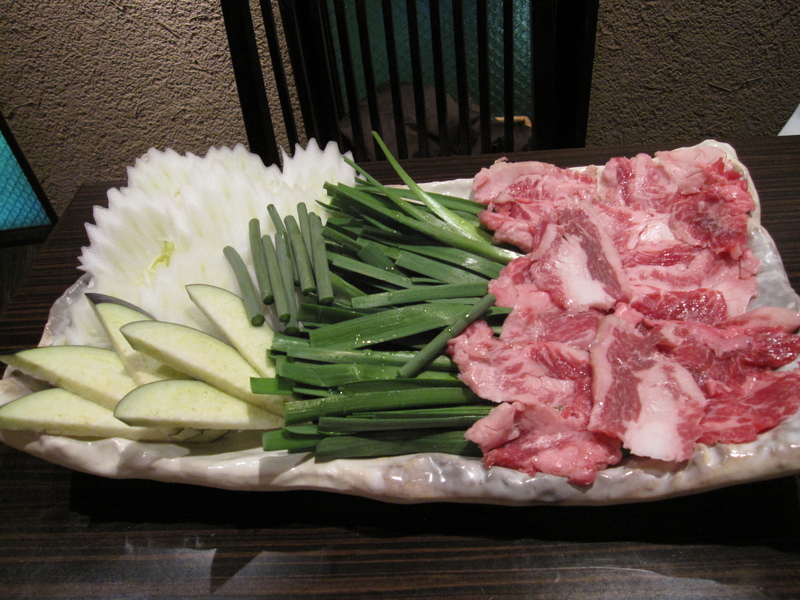 Uma is horse in Japanese, yakiniku is the style of grilling meat at your table, and Takeshi is the name of the proprietor of this establishment, he also happens to be a well-known Japanese comedian. 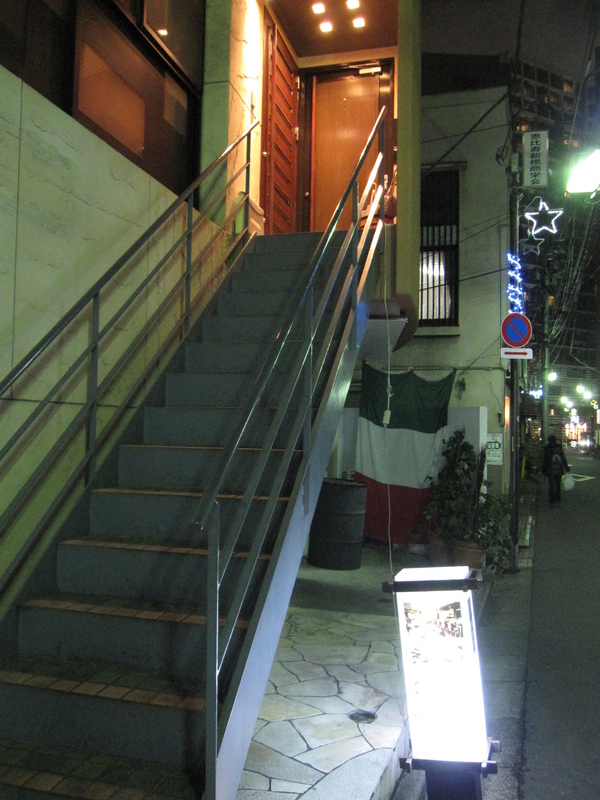 Before I get to the food, one thing I love about Ebisu is that there are numerous interesting little izakaya’s serving up weird and exotic cuisine that you would never find unless you stumbled upon them. We ended up walking around for about 15 minutes before finding our destination. 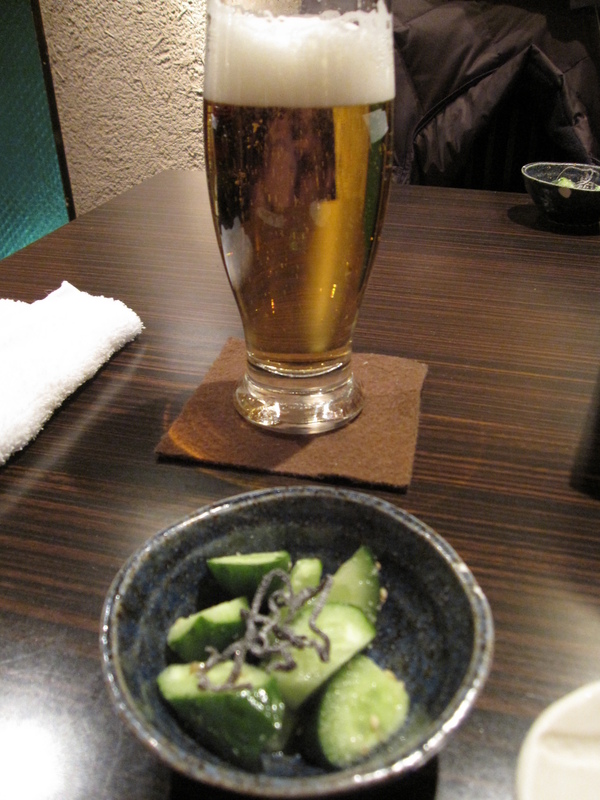 When we sat down we were greeted with a cold glass of draft beer and some lightly pickled cucumbers with salted kombu. I’m not a big pickle or cucumber guy by any stretch of the imagination, but honestly, this wasn’t too bad at all. I even think my younger brother, he who has even stronger negative feelings toward pickled cucumbers than me, would eat this. At least he would if he was hungry enough to eat a horse. 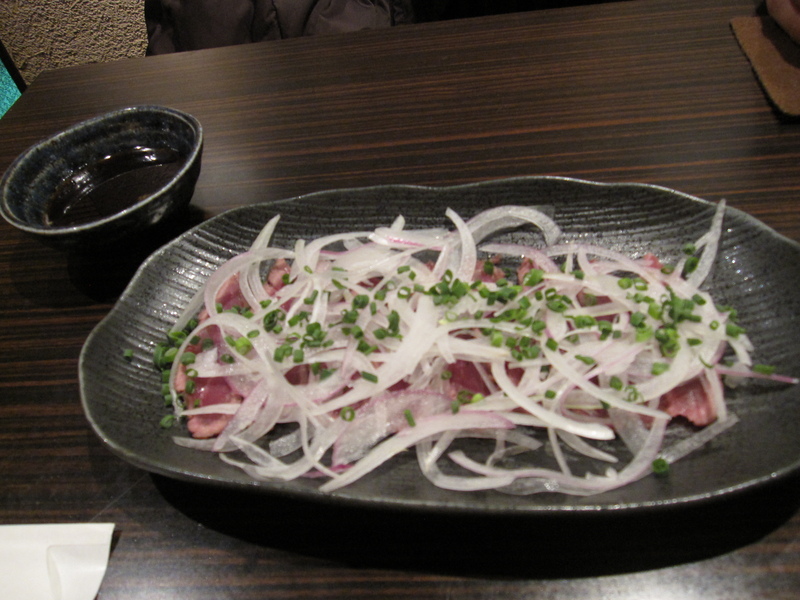 We started off with horse tataki. Rolled in black pepper and lightly seared on all sides, this piece of meat (what part of the animal is still up for debate, but I think it’s the tenderloin) was covered with in thinly sliced onion and chopped scallions. After a quick dip in ponzu (the horse meat, not me) here I am about to have my first taste in equestrian delights. MMMMMMMMMMMM! Honestly, it reminded me of kosher pastrami. I could throw this on some rye bread, slather on the mustard, and wash it down with a Dr Browns and be a happy man. Very delicious and surprisingly familiar to me. I had heard that horse tasted quite a bit like beef, but I think it’s a little more like bison as the muscles don’t have as much fat as cow does. Next up was horse sashimi. Just think of this as beef carpaccio, except that it went nay instead of moo. A bit of fresh grated ginger and garlic, a splash in some tamari, and down the hatch. A little sweeter than beef, and much more tender than I expected. I can’t recall ever eating a beef carpaccio that I enjoyed as much. 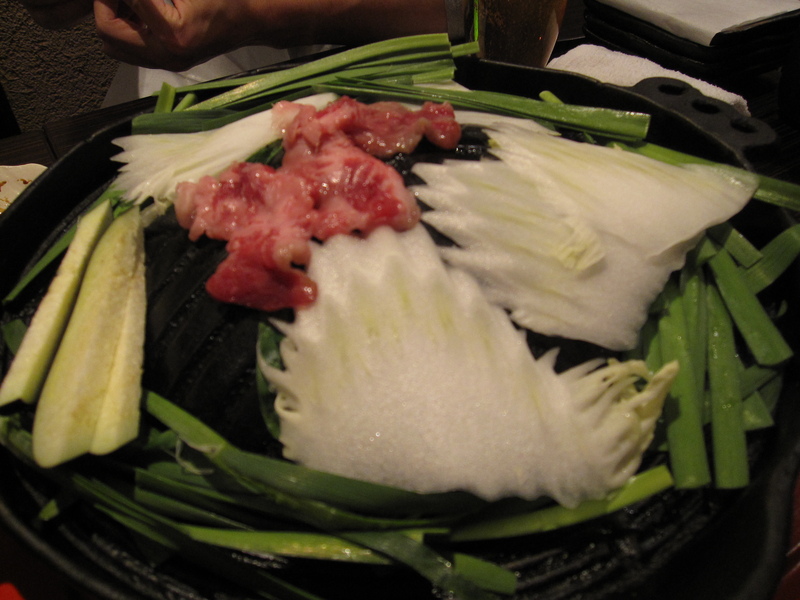 Then we got the yakiniku going. 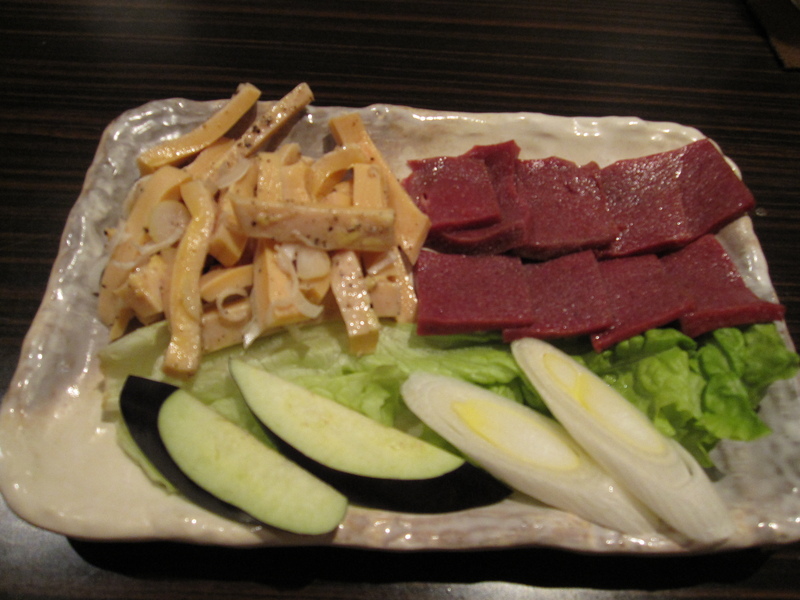 The first plate had some napa cabbage, eggplant, the green part of the scallion, and, of course, some horse meat. This part of the animal comes from the belly/rib area. Think of it as thinly sliced ribeye. Here’s our tabletop grill in full effect. I didn’t get a pic of it, but we each had a dish with three different dipping options for the grilled meat. There as a ponzu-based sauce that was my favorite, some sea salt, and some rice vinegar. For the next cut of horse to be grilled my friend thought he’d throw me curveball, something I’d be hesitant to shove down my throat. He was wrong as it turned out to be one of the most delicious pieces of meat I’ve ever grilled yakiniku-style…the heart! I’m telling you, this was so tender and sweet, with a bit of black pepper it was heavenly! I’d jump a fence to get me some of this. So good, the heart was (that’s my Yoda speak), that we had to get more on our next plate. Besides the heart and horse food (vegetables) this dish also had blood pipes. I don’t know if they were arteries or veins, but they were also delicious. A little rubbery, but after a few chews the clean flavor of the animal really came through. It was almost like eating thick intestines, but clean intestines. Very good indeed. We put the grill aside after that and got a plate of horse weiner. No, not that kind of weiner, I don’t have that big of an appetite. This was a plate of weiner-style sausages. Again, a little sweet, but a very deep, rich flavor. It was also very juicy. Our final dish was horse fried rice. With a little scrambled egg and some scallions this was a very typical fried rice, but with horse meat. I have to say, Americans are a weird bunch. We shun so many different food items that the rest of the world consumes. As I write this blog it becomes clear to me that the reason we’ve not been exposed to things like horse as an edible creature is solely because of politics. If the beef lobby wasn’t so powerful I think we’d be eating all sorts of other animals…guinnea pig, various insects, horse, etc. It really is a delicious animal, and one that doesn’t contribute nearly as much to Climate Change as cows do. If we open our minds as well as our mouths, there’s a lot of tasty things out there we could enjoy. Mr Ed, sorry, but you are one delicious creature! Yuki had requested beef for dinner last night. Who am I to argue with that kind of insightful reasoning? It was a nice night to grill before the brief storm hit, so I picked up my favorite piece of beef to grill…skirt steak. 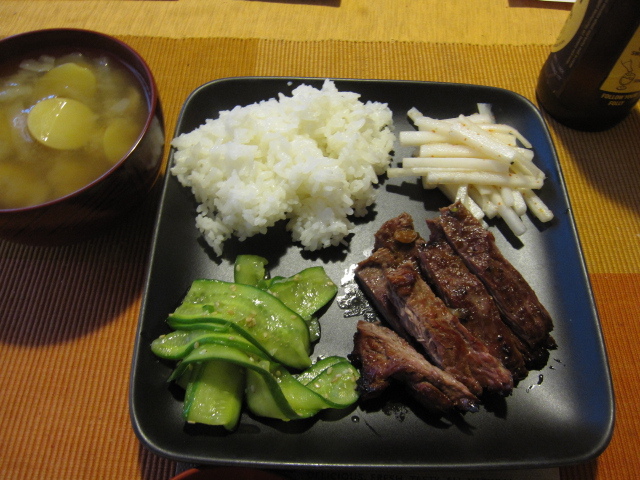 I made an Asian flavored dinner out of it with miso soup, white rice, and quick pickles. I marinated a 1lb steak for about 1.5 hours at room temperature. 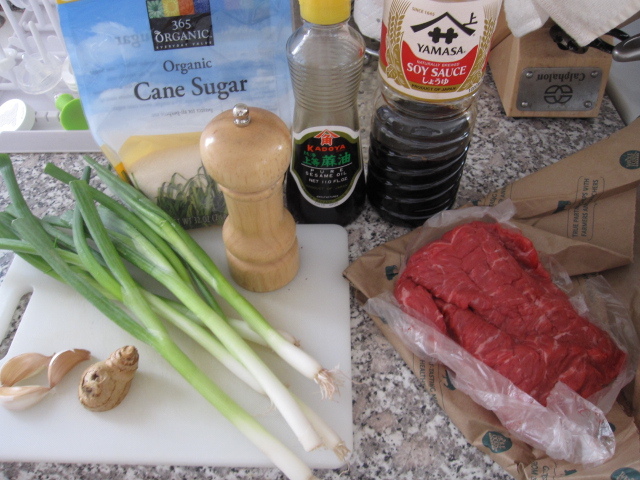 The marinade made by mixing together 3 cloves garlic grated, 1 tablespoon ginger grated, 6 green onions thinly sliced, 1 tablespoon cracked black pepper, 1.5 tablespoons of sugar, 1 tablespoon sesame oil, and 1/2 cup of soy sauce. After mixing together the marinade, I let it sit for a few minutes to allow the flavors to meld before covering the steak in it. I covered everything in plastic wrap and then let it sit while I prepared the rest of dinner. 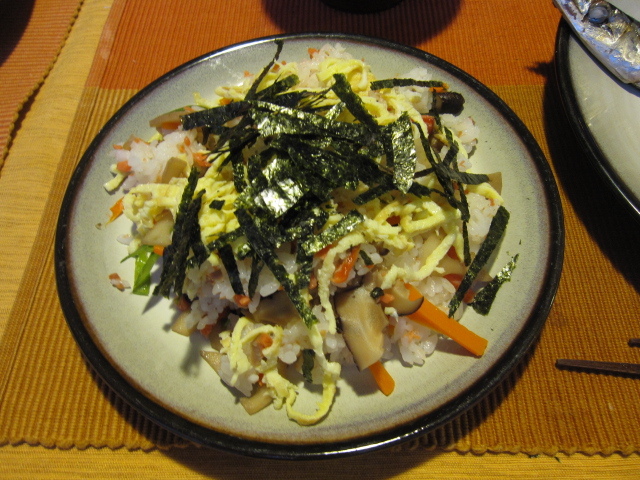 One of the pickles I made was a Korean-style daikon sangchae. Instead of using Korean chili I used Japanese shichimi togarashi instead though. 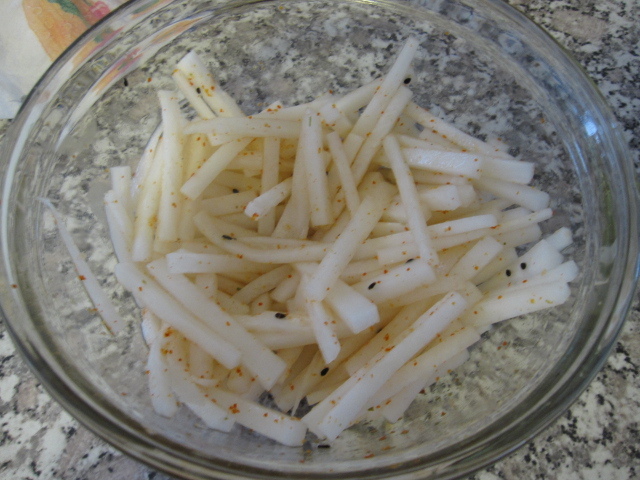 I used about 8oz daikon cut into thin match-sticks, 1 teaspoon apple cider vinegar, 1.5 teaspoons lemon juice, 1/2 teaspoon shichimi togarashi, 1/4 teaspoon salt, 1/2 tablespoon sesame seeds, and 1/2 teaspoon sugar. I mixed all of the ingredients together in a glass bowl and then stirred the daikon in. I covered the bowl with wrap and left it in the fridge until dinner time. The other pickle I made was a Korean cucumber namul. 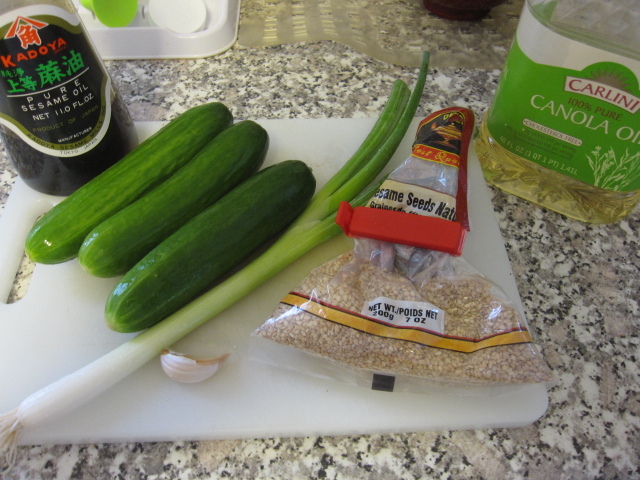 I used 1 teaspoon sesame oil, 3 mini cucumbers thinly sliced on my mandolin, 1 green onion thinly sliced, 1 garlic clove minced, 1/2 tablespoon sesame seeds, 1 tablespoon canola oil. 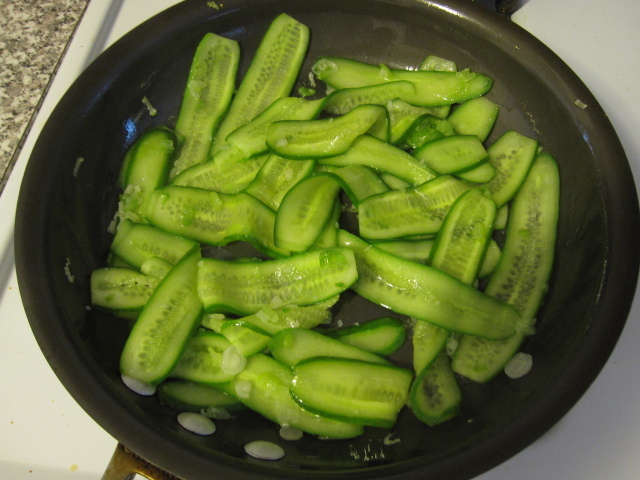 I laid the cucumber slices in a colander, sprinkled them with salt, and let them sit for about 10 minutes. Then I gave them a good rinse and squeezed out the excess liquid. In a hot skillet I poured in the canola oil and then quickly stir-fried the garlic, green onion, and cucumbers, only for about 45 seconds to a minute. I removed the skillet from the heat and then added the sesame oil and sesame seeds. I tossed to blend really well and then set the cucumber aside on a plate. 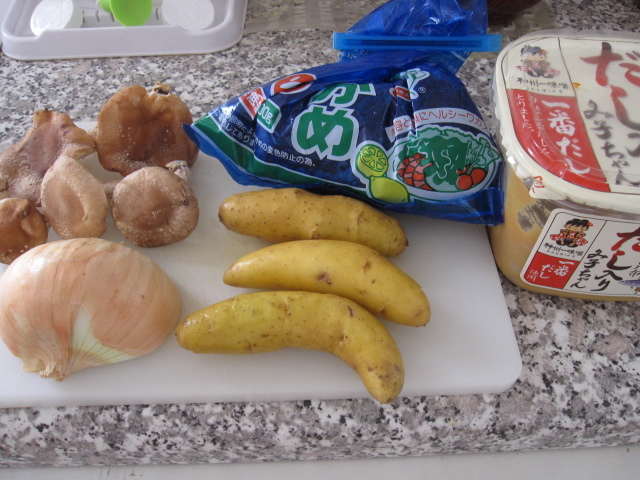 Then I made miso soup using about 3 cups of water, 5 shiitake sliced, 1/2 onion thinly sliced, a bunch of salted wakame rinsed and soaked in water for about 15 minutes or so, 3 fingerling potatoes chopped, and about 1.5 tablespoons of miso. I boiled everything together except for the wakame and miso for about 15 minutes. Then I mixed in the miso. I laid the wakame in the bowls and ladled the soup right on top. All that was left for me to do was to grill up that skirt steak. 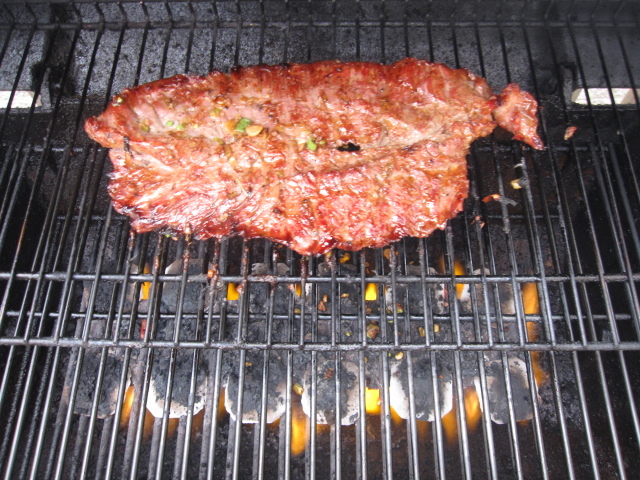 My grill does skirt steak really well on high heat with the steak on the top rack for about 7-8 minutes per side. That gives the steak nice carmelization and grill marks while keeping the meat nice and juicy. I let it rest for about 7 minutes before slicing it up. Time to chow down! This dish is actually from this past Sunday night. Since Yuki’s parents love seafood, like most Japanese, I wanted to grill some red snapper for Tamiko on Mother’s Day. Our friends that gave us the Rick Bayless cookbook were up at Tensuke Market so I had asked them to bring me some snapper. Unfortunately, they did not have whole snapper, just filets. They did, however, have Sanma. I remember Tamiko made Sanma for me once in Japan so I thought it’d be fun to grill some up and return the favor. 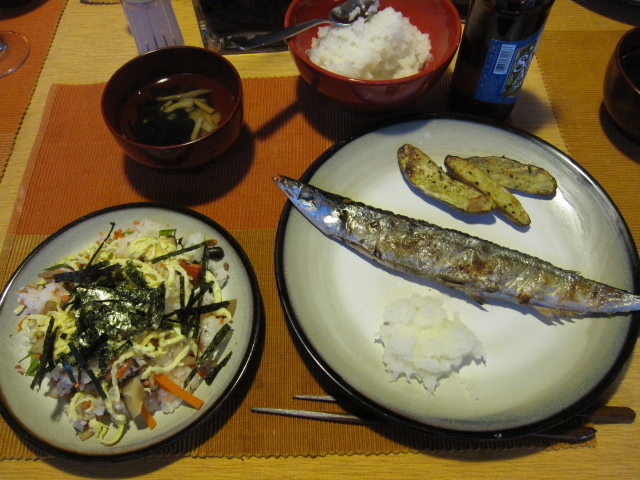 Sanma is a Pacific Saury, commonly called Mackerel Pike in English. About a foot long and slender it’s simply salted and grilled, complete with the guts. You can certainly eat the guts, as Yuki’s brother-in-law Jun does, but they’re very bitter. I don’t eat them, too bitter for me. After grilling you simply pull the skin and meat off the bones and chow down. The skin gets very crisp and tasty while the meat stay moist. 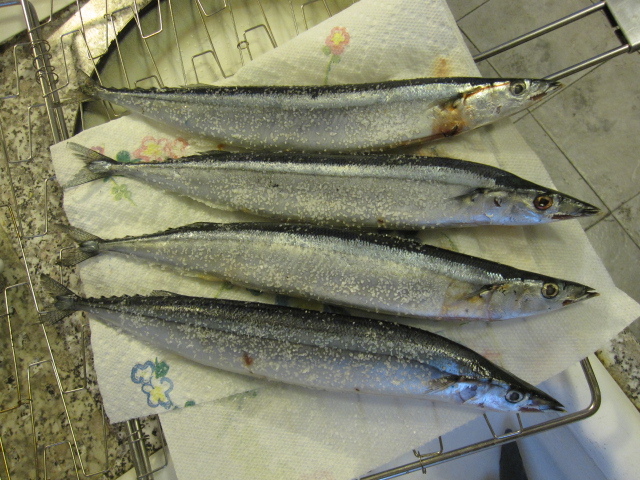 To prepare the Sanma I simply washed them down with cold water and patted them dry. Then I heavily salted both sides of the fish and let it rest for about 20 minutes. 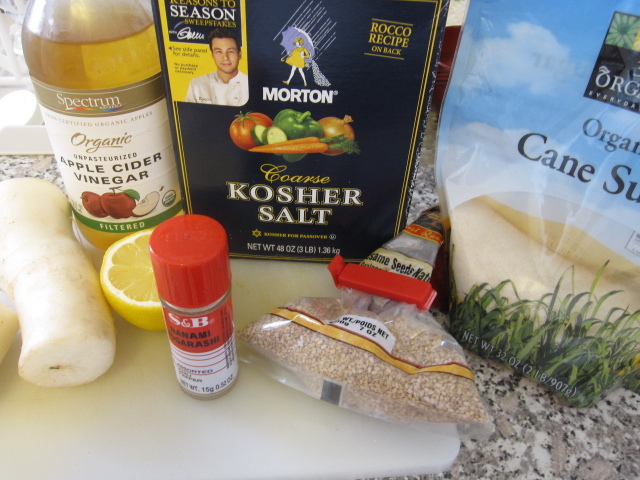 This allows the salt to stick to the fish and add the depth of flavor while keeping it a little less oily. 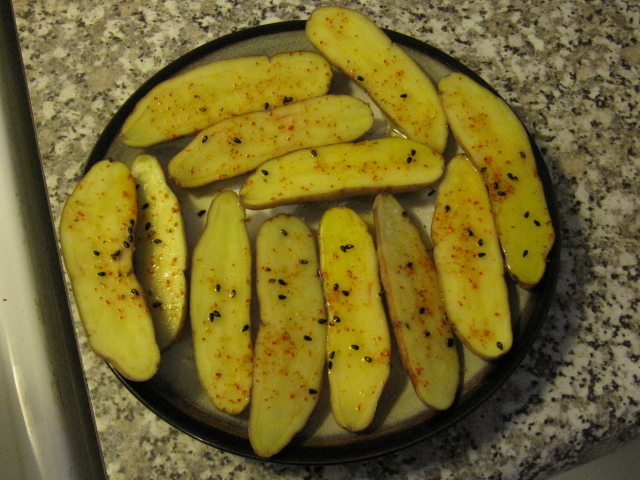 I had some fingerling potatoes that needed to be used up so I halved them, drizzled them with olive oil, and sprinkled some salt and shichimi togarashi on them. I heated up the grill to med-high. The potatoes went on the top rack while the fish were on direct heat. I cooked one side of the fish for about 8 minutes then flipped it over and cooked the other side for about 6 minutes. Not sure why, but Tamiko said you should cook the first side a little longer. Since this was my first go at grilling Sanma I happily took her experienced advice. Glad I did because they cooked to perfection! 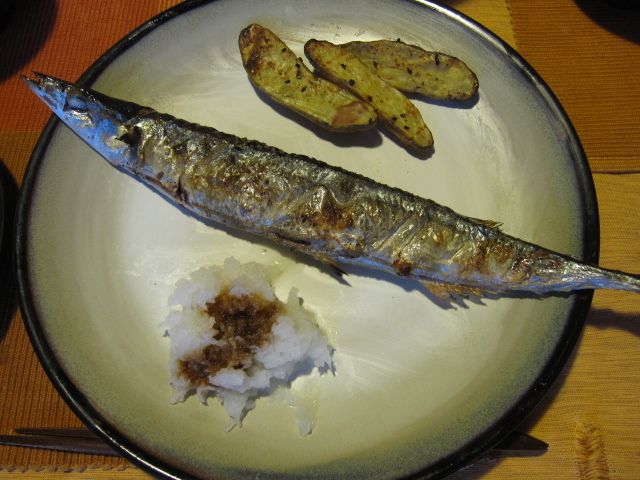 Sanma is typically eaten with grated daikon radish that has a little soy sauce poured on top of it. So, I grated some daikon and we poured a little soy. Tamiko made Bara Sushi to accompany the Sanma. Bara loosely translates to spread out, so it’s basically just spread out sushi. She made two cups of rice and mixed some rice vinegar, sake, and mirin (maybe a little sugar too, not exactly sure what her blend of sushi rice consists of, but you can find multiple recipes for sushi rice online if you feel like trying your hand at it) into the rice. I fanned the rice down while she mixed the vinegar mix in to help rid some of the moisture. Then, she mixed in some smoked salmon, thinly sliced pea pods, thinly sliced lotus root, thinly sliced soy simmered shiitake, and carrot matchsticks. She then made some scrambled egg crepes, thinly sliced them and placed them on top. Finally, it gets garnished with thin strips of nori seaweed. It is absolutely delicious! 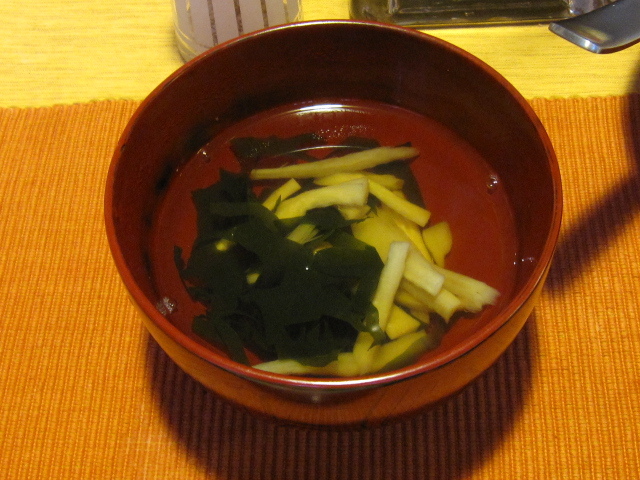 The soup was a simple clear dashi broth with wakame seaweed and eryngii mushrooms. I wish more Americans would cook whole fish instead of the typical flavorless tilapia filets you see at every grocery store. Sanma is such a flavorful little fish that really would be a waste to add more than just salt. By keeping the guts inside you really get a full fish flavor, and you certainly don’t have to eat the guts. 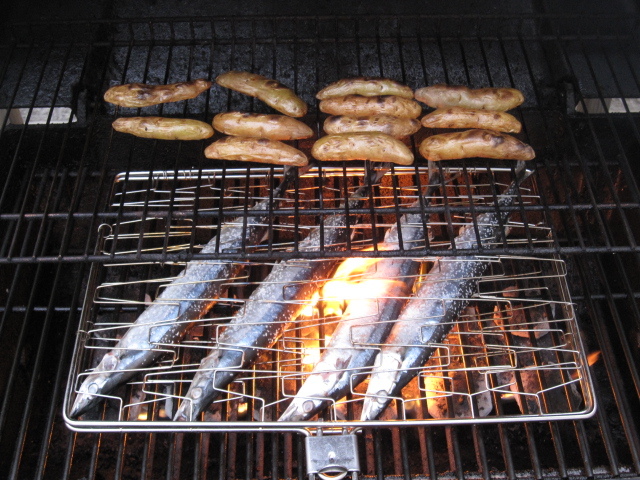 Full of omega-3’s and lower in mercury, it’s a great fish to grill up and enjoy with a cold beer or some cold sake. Sorry I haven’t put a post up in a while, been kind of busy the past week with my beautiful baby boy, Otis. Yeah, I know, badass name. He is a handsome little badass though, so it fits. At any rate, Yuki’s parents came in from Japan a week ago to help us out. They’ve done all of the cooking and I absolutely love it! 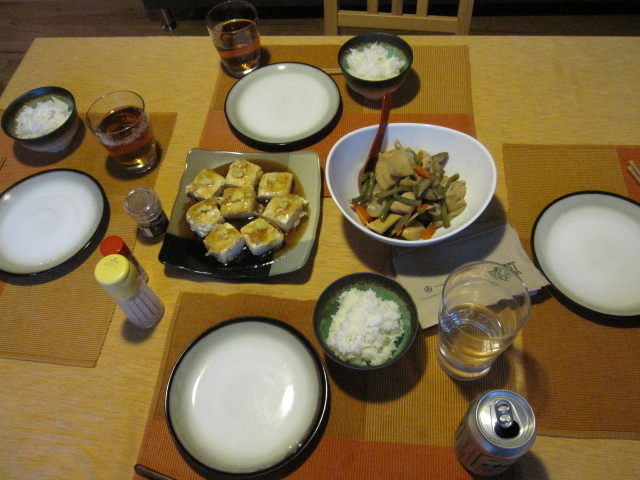 I do want to cook, and will in a day or two, but I am definitely enjoying their Japanese homestyle food. The other night they made this classic dish for us, Chikuzen Ni. Chikuzen is the old name for Kyushu, one of Japans main islands. Ni means simmered. 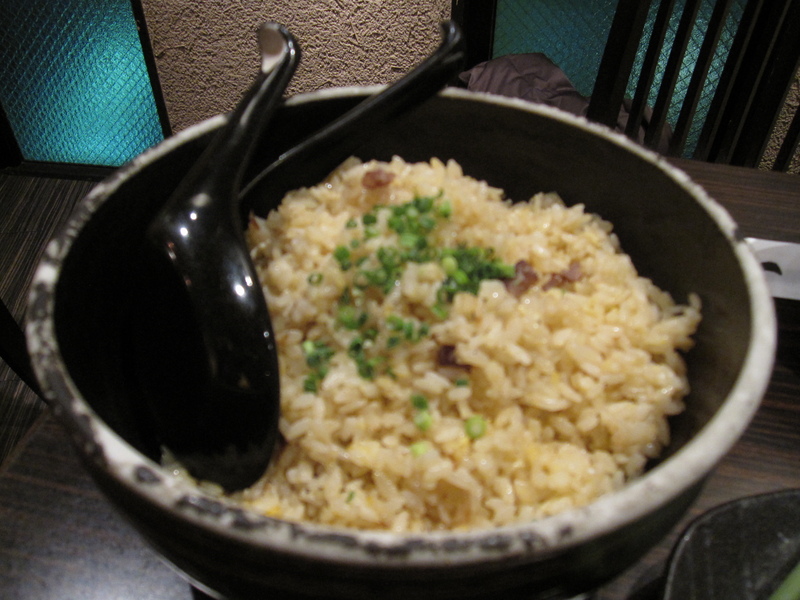 It’s basically a simmered dish that comes from Kyushu. Tough to figure that one out, eh? I don’t know exact measurements because I was busy changing diapers while they cooked. What they did was make a bonito dashi and added soy sauce, sake, mirin, and a touch of sugar. 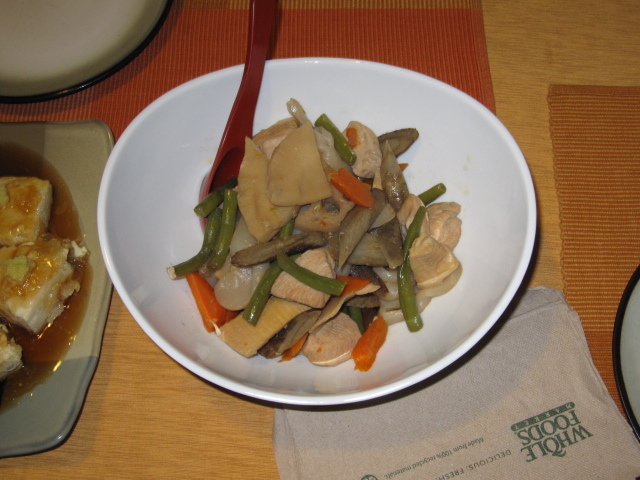 In that they simmered some chopped up skinless chicken thighs, carrots, gobo (burdock root, a root vegetable native to Japan and other countries in that region), lotus root, bamboo shoot, haricots vert, and konnyaku. It is absolutely heartwarming deliciousness! 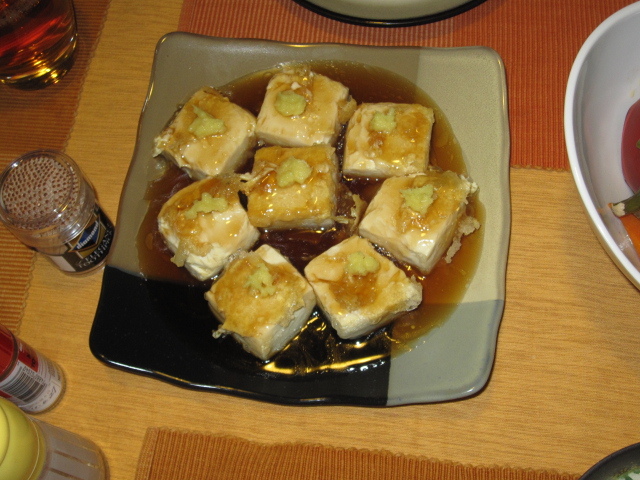 To go with the Chikuzen Ni they made some pan-fried tofu. After pressing the water out of some silken tofu they chopped it up and fried it in my big skillet with some vegetable oil. 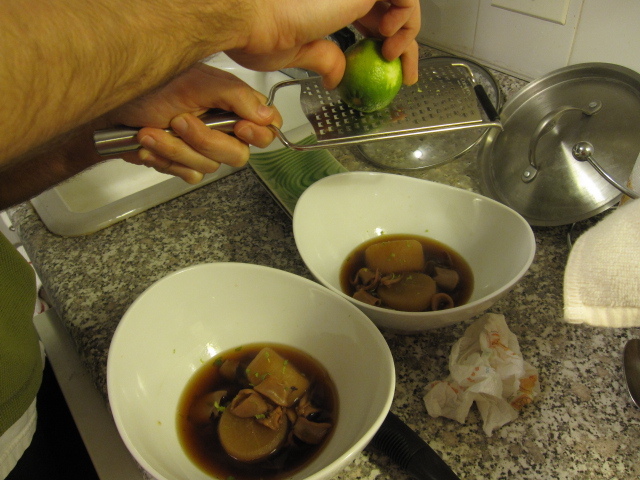 After they took it out they poured in a mixture of bonito dashi, soy sauce, sake, mirin, sugar, and potato starch. Basically, it’s the same as the broth for the Chikuzen Ni. The added starch gives it a nice gelatinous texture. On top they put a little fresh grated ginger. White rice was on the side and a cold beer was in hand. Valentine’s Day…you gotta love holidays that are created for the sole purpose of capitalist pleasure. While the origins of Saint Valentine had absolutely nothing to do with lovers, today Hallmark sells millions of cards and Jared sells tons of ugly jewelry. Restaurants are always packed with their special Valentine’s prix fixe dinners. Extremely disappointed by every meal we’ve gone out for at Valentine’s this year I took the truly romantic way through the day of lovers and put my own hard work into a beautiful meal for the love of my life. I made a Japanese flavored Osso Bucco. Let’s be honest, is there anything sexier than slow-braised oxtails? While I have never braised oxtails (actually cow tail, not an ox) the principles of braising are the same across the board. Brown your meat, saute your mise en place, and simmer it all together for a couple of hours minimum while keeping the braising liquid about 3/4’s of the way covering your meat. 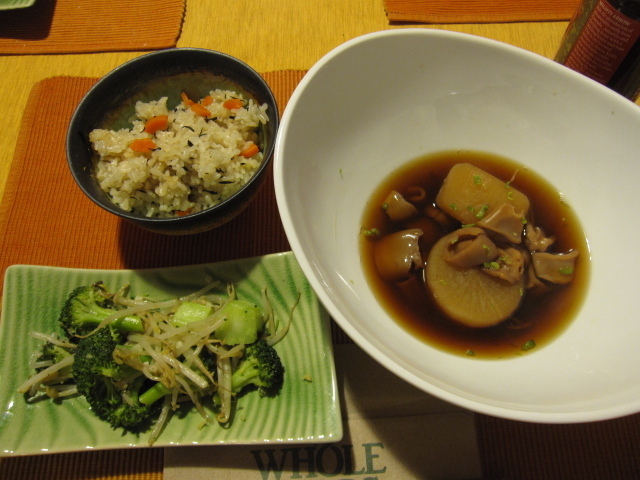 To make this one Japanese flavored I used dashi and soy instead of beef stock and wine. To start I made my dashi. I put 3 cups of water and 1/4 cup of dried anchovies in a pot, brought it to a boil, covered it, turned the heat to med-low, and let it simmer for about a half hour. 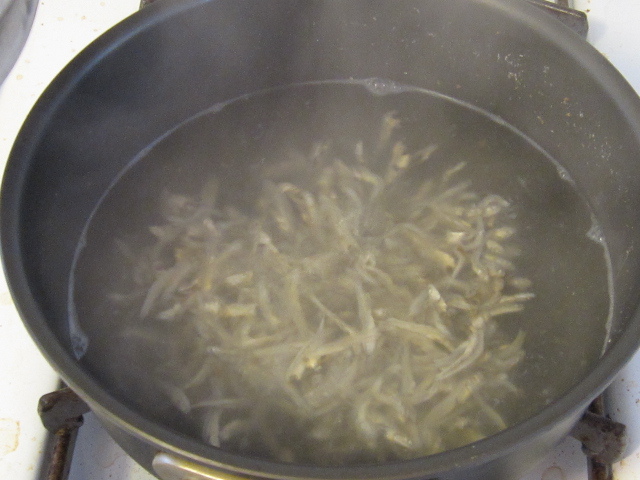 Then I strained out the anchovies and set the dashi aside. 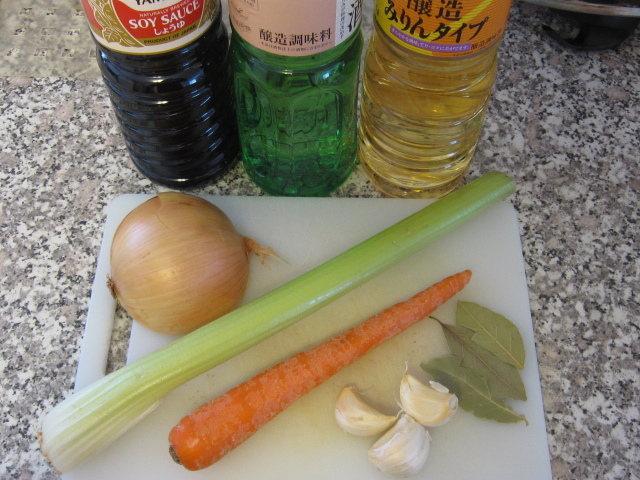 To flavor the dashi, my mise en place, I used 4 tablespoons of soy sauce, 3 tablespoons of sake, 2 tablespoons of mirin, 1/2 onion diced, 1 rib of celery diced, 1 carrot diced, 3 cloves of garlic smashed, and 3 bay leaves. 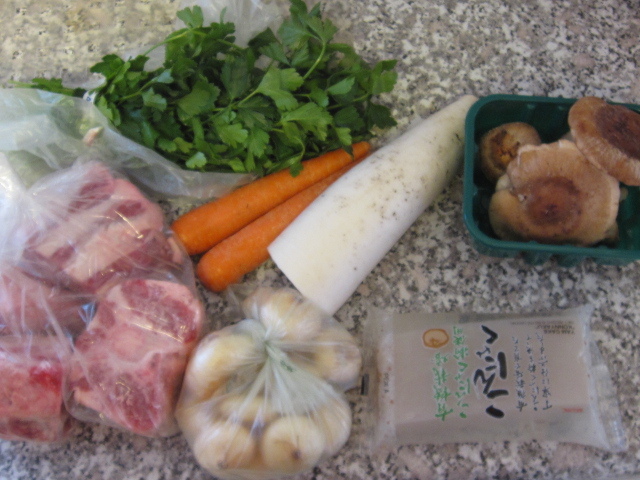 The ingredients I used to serve included 3 pounds of beef oxtail cut into 4 portions (have your butcher use his saw to get through the bone, I went to Olympic Meats for mine), about 1/4 cup of parsley chopped, 2 medium carrots chopped, 1 pound of daikon chopped, 12 cipollini onions skin peeled, 1 package of konnyaku, and 1 package of shiitake halved (large ones quartered). To get started I heated up a few tablespoons of olive oil in my large stock pot. I dredged the oxtail pieces in flour (no need to season the flour since I used soy sauce, without soy sauce you’d probably want to season the flour with salt and pepper) and browned all sides for a couple of minutes. I did two at a time so as not to overcrowd the pot. I set the browned oxtails off the side. Once the oxtails were all browned I added another couple of tablespoons of olive oil and added all of my mise en place. I sweated it all down for about 5 minutes. Then I put the oxtails in along with any accumulated juices on the plate and poured the reserved dashi in. Once the dashi came to a boil I let it rumble for a few minutes and skimmed the surface a few times for a clearer liquid. Once I finished skimming I added the soy, sake, and mirin. I covered the pot, turned the heat to med-low, and let it simmer for about an hour and 15 minutes. During this time is when I prepped all of my serving veggies. For the konnyaku I cut it in a very traditional Japanese way. I sliced the block into 1/4 inch strips. I put a slit in the middle of each and then folded inside of itself to make this braided shape. Not only does this add visual appeal, but I gives more surface for the konnyaku to absorb the flavors of the broth. After the initial hour and 15 minute braising time I removed the oxtails and strained out all of the mise en place. With the back of a wooden spoon I squeezed out every last drop of flavor from the soft onion, celery, and carrot. I wiped out my stock pot, poured the strained broth back in, put the oxtails back in, put the serving veggies in, brought it up to a boil, covered the pot, turned the heat to med-low, and let it simmer for another 45 minutes. That was enough time for the daikon to absorb the broth flavors and become nice and tender. 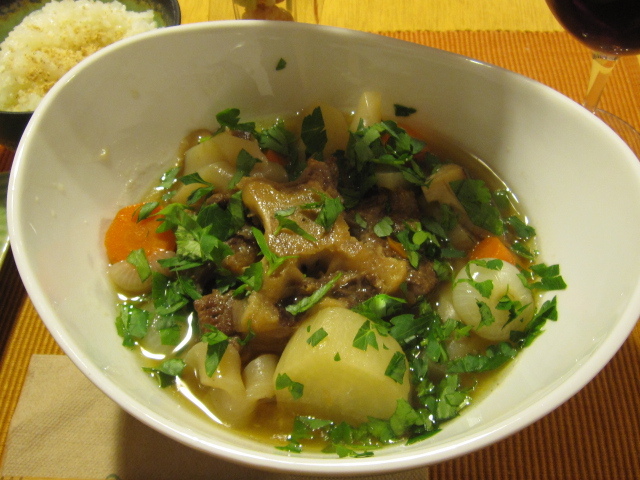 To serve, I placed on piece of oxtail in a large bowl and surrounded it with broth and veggies. I sprinkled the parsley all over the top. On the side was white rice with ground sesame seeds and some seaweed salad (the same kind you get at your neighborhood sushi joint, I picked some up at the Mitsuwa Market). As if I weren’t already in-love with myself, this dish made me fall heads-over-heals in-love with myself. I can only image what it did to my wife. In order to solidify my role as a good Japanese housewife I decided to make another classic comfort dish from the Land of the Rising Sun. 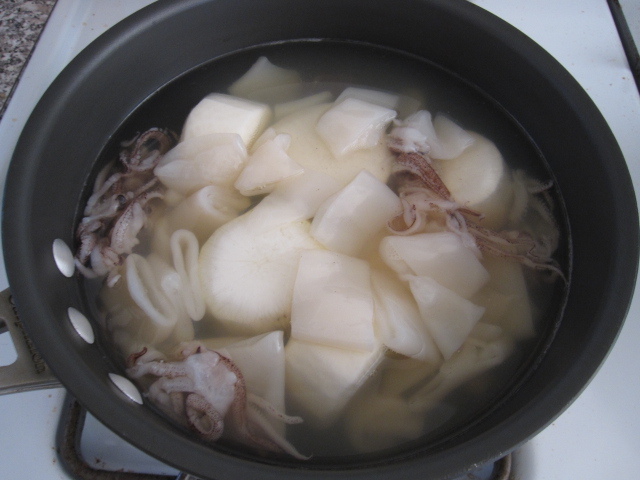 I haven’t made anything with squid in a long time and came across this recipe from a Japanese cook book that I have. Since I had a piece of daikon in my fridge that I needed to use, it all just seemed too perfect. And yes, I am perfect! The first thing I need to do was make 3.75 cups of dashi. We don’t have any bonito flakes in our fridge, but we do have dried anchovy in our freezer that are also used for various types of dashi. In a soup pot I poured in a little more than 3.75 cups of water knowing that some would evaporate and added about 1/3 cup of the dried anchovy. I brought it to a boil, covered it, lowered the heat to med-low, and let it simmer for about 3o minutes. Then I strained out the fish and had a really nice flavorful dashi. 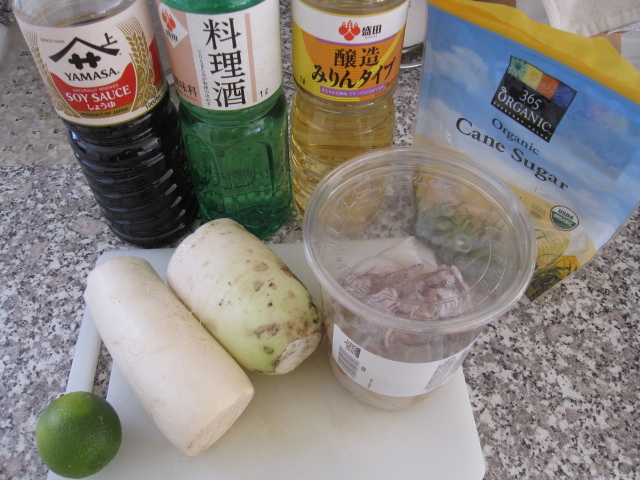 The rest of my ingredients for this dish included 4 tablespoons of soy sauce, 3 tablespoons of sake, 2 tablespoons of mirin, some lime zest, about 2 pounds of daikon, 1 pound of squid (body and tentacles), and 1 tablespoon of sugar. 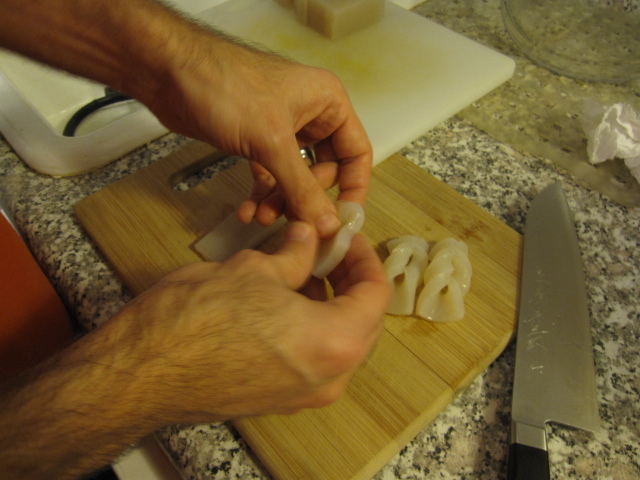 I cut the daikon into chunks about 1.25 inches thick and rounded the edges with a pairing knife. I’m not sure why they round the edges, maybe it allows the daikon to cook more evenly or maybe it’s just an aesthetics thing, but you probably don’t need to do it if you don’t want. Being the good Japanese housewife that I am, I went all out. I put the cut daikon into cold water then drained it just before cooking. That helps keep the texture firm. I sliced the squid bodies into 1/2 inch strips and cut the tentacles in half. 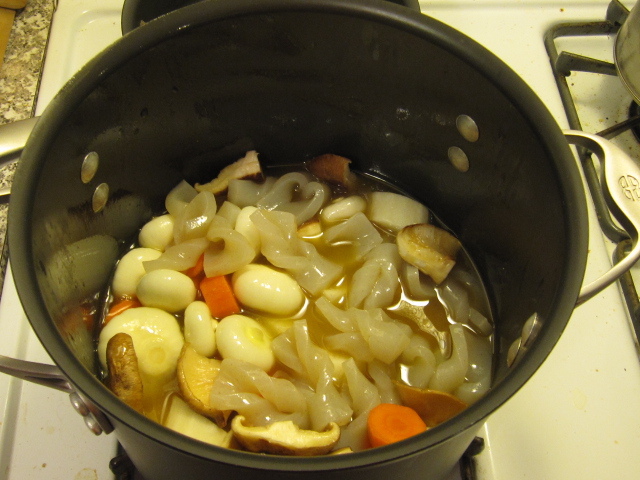 I put the daikon and squid into a heavy pot and poured the dashi in. 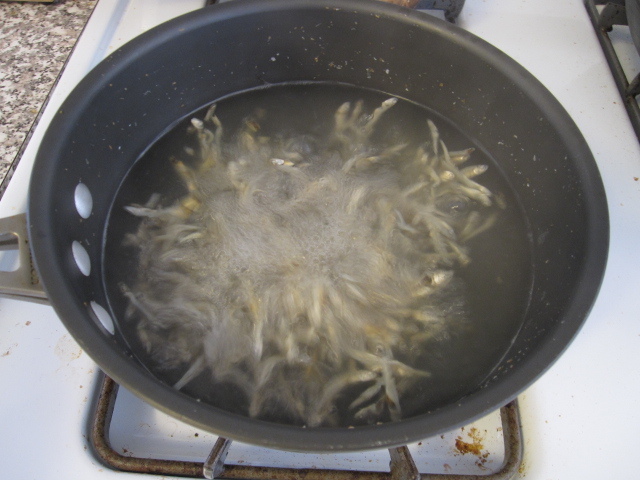 I brought it to a boil and let it cook for about 5 minutes. Every 30 seconds or so I had to skim the surface to keep the dashi nice and clear. It’s amazing that 1 pound of squid seems to have more muck than a 3 pound chicken when boiling. So you really need to skim a lot. 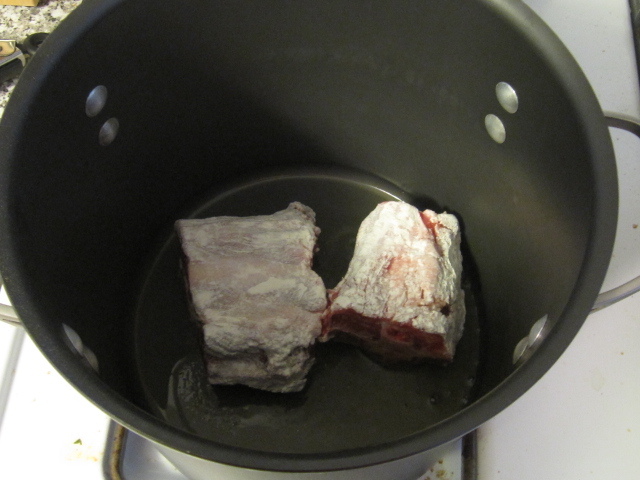 Once the dashi cleared up I turned the heat to low and added the soy sauce, sake, mirin, and sugar. I covered the pan and let it simmer for about 45 minutes or so. 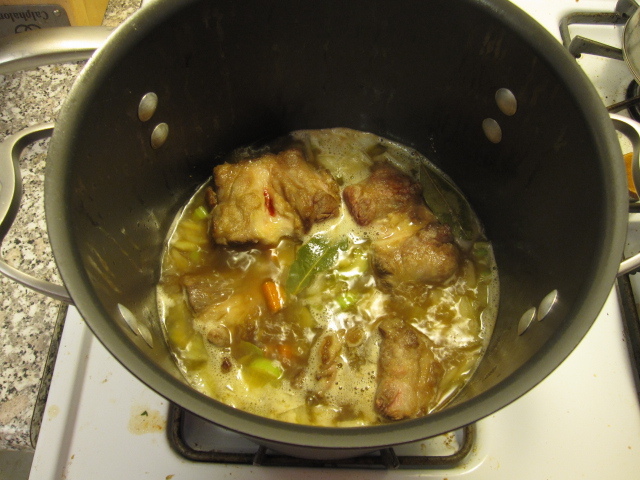 Every few minutes I gave the pot a good shake to make sure the flavors of the dashi were well mixed. 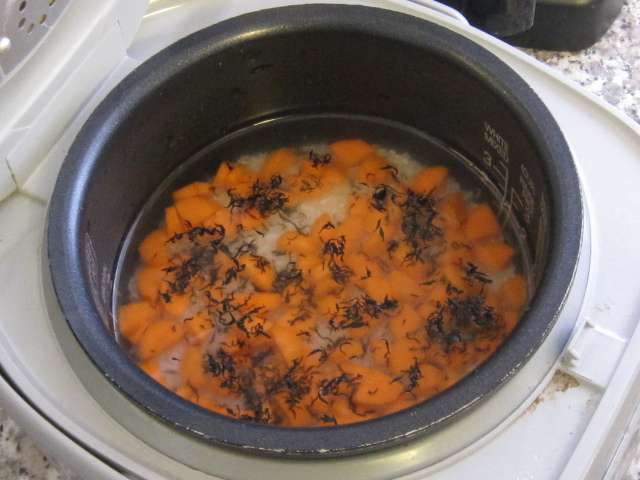 While the squid and daikon were simmering I made some hijiki-carrot rice. After rinsing 2 cups of rice and measuring out the liquid I added a tablespoon or so of dried hijiki and 1 chopped carrot. I let it sit for a half hour and then started the rice cooker. Actually, I had this ready to go before starting the squid and daikon. But I didn’t hit the start button until the simmering started for timing purposes. For a side dish to get more vegetables in the meal I made a simple stir-fry. 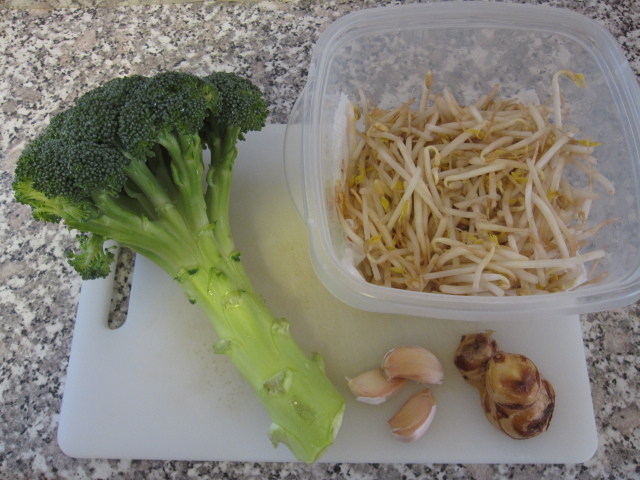 I cut up 1 head of broccoli, had a couple of ounces of bean sprouts, 3 diced garlic cloves, and 1 inch of diced ginger. I heated a skillet and added 1 tablespoon of sesame oil then added the garlic and ginger. 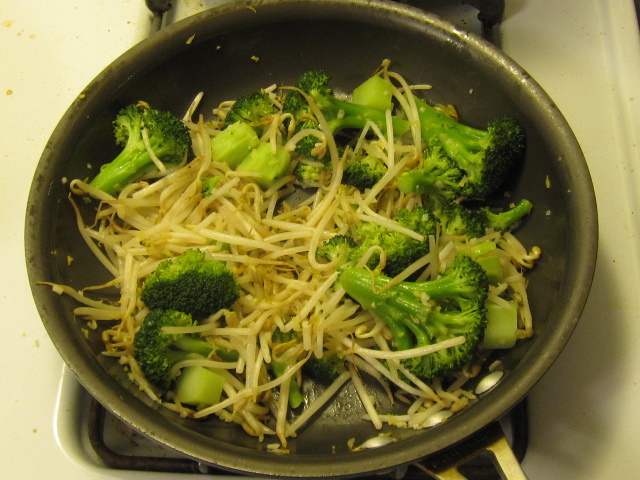 After about 30 seconds I tossed in the broccoli and let it go for about 5 minutes before adding the bean sprouts. About 2 minutes later and it was ready to eat, just a sprinkle of salt and pepper was needed. 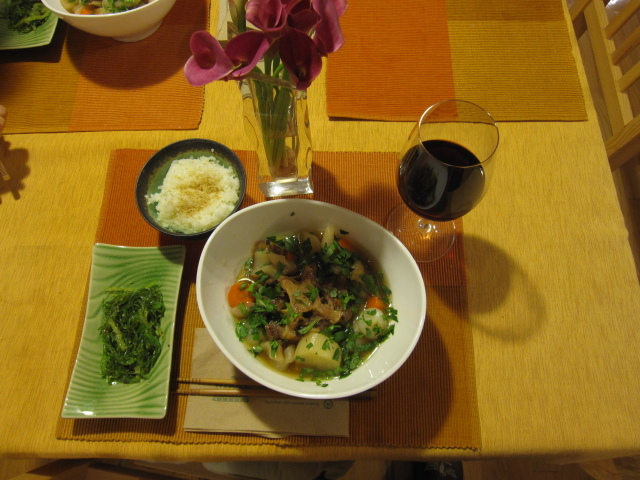 For serving I put some of the squid and daikon in bowls with some of the dashi. Then I grated some of the lime zest on top. Yes, as you can see in the picture I do have the hairiest arms you’ll ever see on a Japanese housewife…I hope. In Japan they’d use yuzu instead of lime, but I couldn’t find any yuzu at the store. The lime worked really well though. And the squid, oh brother the squid! It was so soft and tender it literally melted in our mouths. 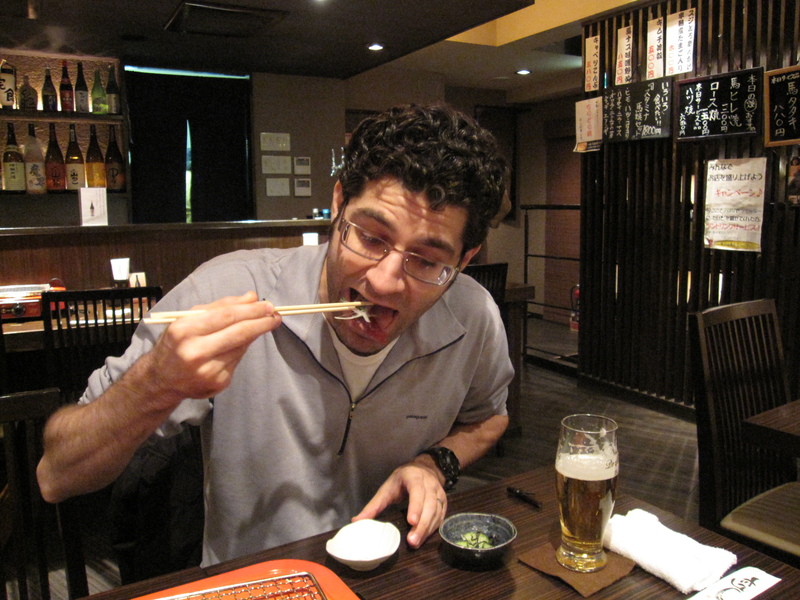 I haven’t had squid that good since we were in Nara, Japan over a year ago during squid season. 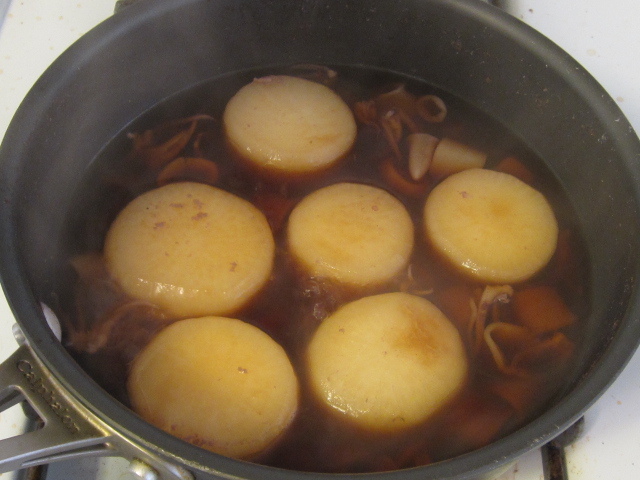 And if you’ve never eaten daikon simmered in a soy-dashi broth you’re missing out on one of life’s finer flavors. This was the best meal I’ve cooked in a while. OIISHII!! !